Melon fruit contains a lot of water (about 95% of the fruit) also rich in vitamins and minerals, so it has many benefits for our health. From the side of water content, melons can give sense of cool and soothing effect, so it can relieve heartburn and cleanse the kidneys from the remnants of metabolism. Benefits of melon fruit itself has been tested to treat various types of diseases ranging from mild to chronic diseases. Melons are low in calories, with just 64 calories in a 1-cup serving of honeydew balls and fewer calories in cantaloupe, casaba or watermelon balls. 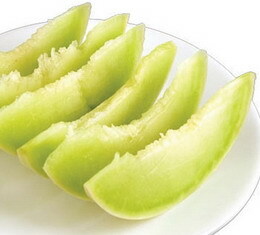 At the same time, melons are high in essential vitamins and minerals. They contain almost no fat or saturated fat, making them an excellent choice for snacks or a side dish. Melon Nutritional Values is 15.00 mg calcium; 25.00 mg phosphorus, 0.5 mg iron, 34 mg of Vitamin C; 640 mg IU Vitamin A, and 0.03 mg of Vitamin B1. Melon contains an anticoagulant called adenosine so it can stop the clotting of blood cells that can lead to stroke or heart diseases.